Prior to receiving his first National Disability Insurance Scheme (NDIS) plan in 2017 Robbie was shy with strangers and underconfident in public. He was fearful of lifts, incapable of using public transport and spent most of his time at home. How things have changed! Every Saturday night Robbie now has a support worker to take him out to the pub with his peers, to go bowling, to speedway karaoke or to the movies. He’s also gone on several overnight excursions as far afield as Sydney, as well as to football matches and concerts. All of this would not have been possible without his NDIS funding, according to father David. “I never thought I’d ever have to ask him ‘what time are you coming home’, but now I have to on a regular basis,” says David. Robbie has Down Syndrome and lives at home with David and mum Julie in the NSW regional centre of Dubbo. The family has had a difficult life since David was badly injured in a motorbike accident on the way back from work in 1988. “I suffered severe injuries, including to my body and brain, and we’ve been on a pension ever since,” says David. With only so much money to go around, Robbie’s capacity to engage in community and social activities was limited. Now, as well as his social activities, Robbie has one-on-one support to improve his gross motor skills through bike riding, swimming and attending the gym. He also uses his NDIS funding to access speech pathology, something that was too expensive previously. 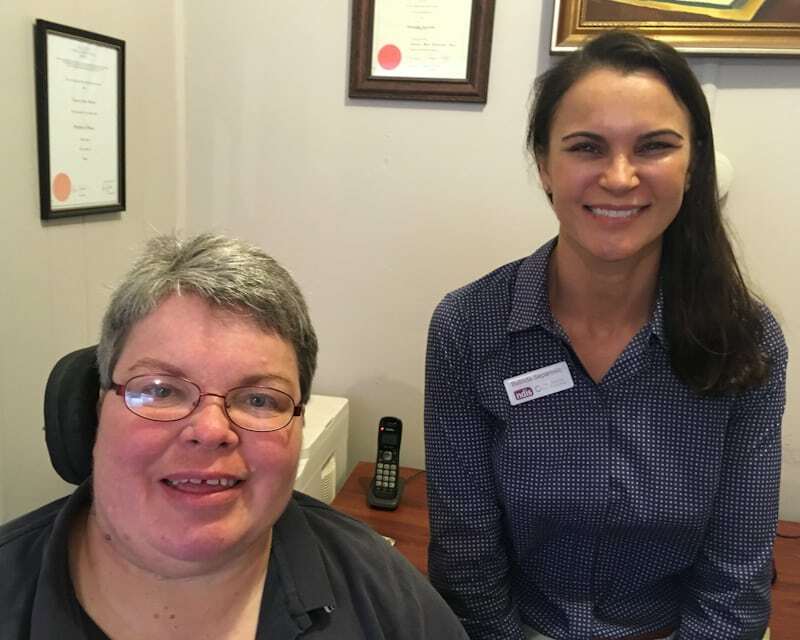 “We had the benefit of a great Local Area Coordinator, Louise from (NDIS partner) Social Futures, who has just been so good about understanding Robbie’s situation,” says David. 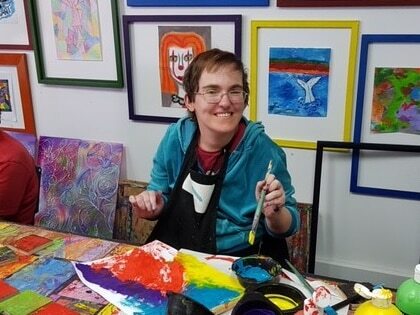 “If we could bottle her, we would.” The family works with Robbie’s disability service provider Breakthru to achieve his goals, the main one being to become more independent. Since starting to attend Breakthru’s day programs five days a week, support workers report that Robbie has grown in confidence and physical ability and made very positive relationships with his peers. “Robbie is a star performer in our drama group, getting on stage and independently singing and dancing, and also works as a group performer,” a Breakthru report states. 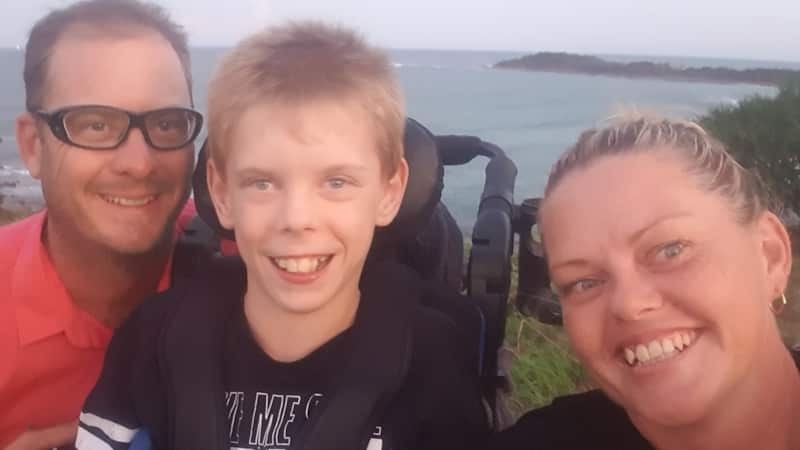 Prior to receiving his first National Disability Insurance Scheme (NDIS) plan in 2017 Robbie was shy with strangers and underconfident in public. He was fearful of lifts, incapable of using public transport and spent most of his time at home. How things have changed! Every Saturday night Robbie now has a support worker to take him out to the pub with his peers, to go bowling, to speedway karaoke or to the movies. He’s also gone on several overnight excursions as far afield as Sydney, as well as to football matches and concerts. All of this would not have been possible without his NDIS funding, according to father David. “I never thought I’d ever have to ask him ‘what time are you coming home’, but now I have to on a regular basis,” says David. Robbie has Down Syndrome and lives at home with David and mum Julie in the NSW regional centre of Dubbo. The family has had a difficult life since David was badly injured in a motorbike accident on the way back from work in 1988. “I suffered severe injuries, including to my body and brain, and we’ve been on a pension ever since,” says David. 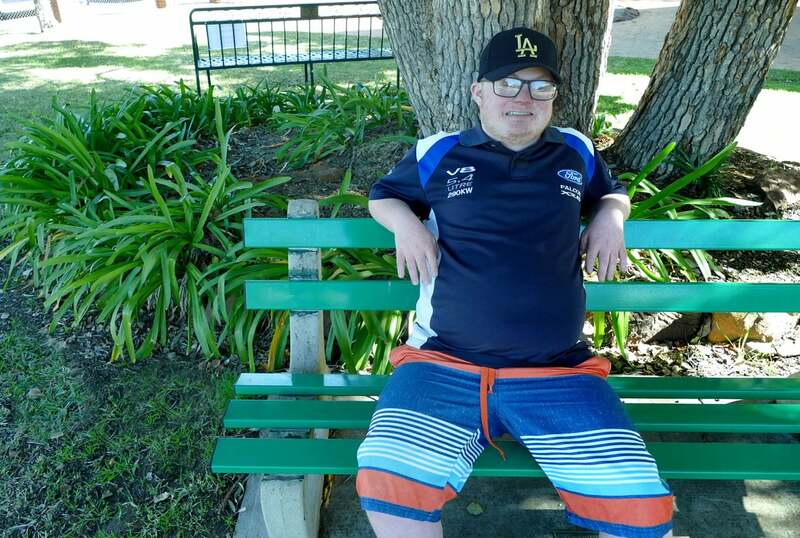 Now, as well as his social activities, Robbie has one-on-one support to improve his gross motor skills through bike riding, swimming and attending the gym. He also uses his NDIS funding to access speech pathology, something that was too expensive previously. The family works with Robbie’s disability service provider Breakthru to achieve his goals, the main one being to become more independent. Since starting to attend Breakthru’s day programs five days a week, support workers report that Robbie has grown in confidence and physical ability and made very positive relationships with his peers. 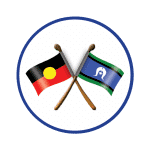 Robbie’s family is currently working with Breakthru to rent a home so that Robbie and some of his peers can begin to have weekend respite care on a regular basis.